The Quickest Way To Destin is the Mid-Bay Way! How do I consolidate transponders to a single account? 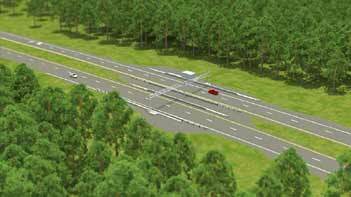 The 3.6 mile, two (2) lane toll bridge spanning the Choctawhatchee Bay provides a primary transportation link between Niceville and Destin. An 11-mile, limited access, 2-lane, separately tolled highway that connects the north end of the Mid-Bay Bridge with SR 20, SR 285 and SR 85. 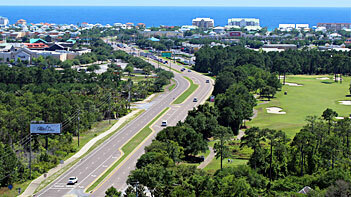 An 0.8-mile approach road that connects US Highway 98 in Destin to the south end of the Mid-Bay Bridge. Save time and get to the beach faster! The quickest way to Destin and the beaches of Okaloosa County and South Walton is the Mid-Bay Bridge across Choctawhatchee Bay. Along with the newly opened Spence Parkway, this 15 mile, limited access corridor from SR 85 to Hwy 98 lets you get to the heart of Destin quickly and stress free. Since opening in June 1993, the Mid-Bay Bridge has served as an integral part of our north-south highway system in Northwest Florida. 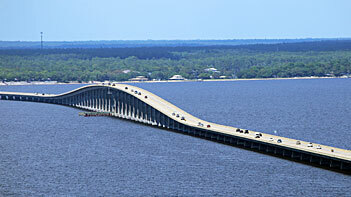 The 3.6 mile, two (2) lane toll bridge spanning the Choctawhatchee Bay in Okaloosa County, provides a primary transportation link between the communities of Niceville and Destin. The Bridge offers local citizens a convenient option for commuting to / from work, getting to school, shopping, or heading off to recreational activities. 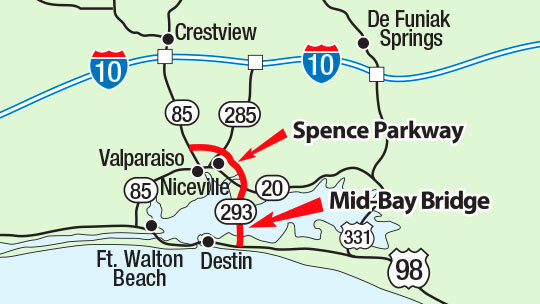 With the Spence Parkway now open, local travel is even more convenient, travel between I-10 and the beaches is quicker, and the hurricane evacuation route for southern Okaloosa County vastly improved.